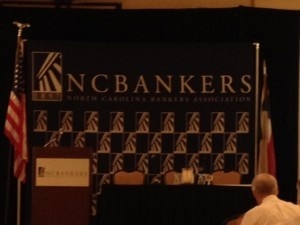 Conference Audio Visual in North Carolina by AV Connections, Inc.
We were pleased to provide conference audio visual for the North Carolina Bankers Association's conference at the Greensboro Airport Marriott this past week. We also provided a technician to support the conference audio visual rentals to be sure the meeting went smoothly. If you can do it, it is always best to include in your planning the presence of an experienced technician on hand. Our technicians arrive on time, completely prepared, and are willing to go the extra mile to be sure the meeting's oratory and visual collateral are perfectly presented. 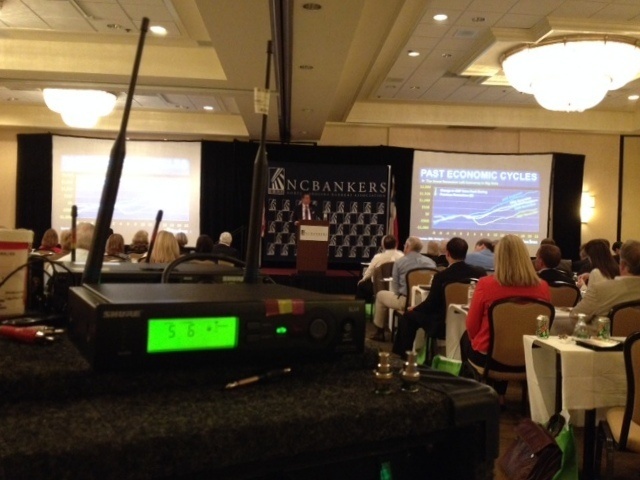 It was another seamless day of presentations with our great conference audio visual! 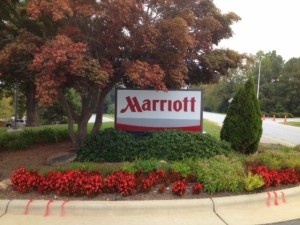 We're looking forward to seeing our friends at the Greensboro High Point Airport Marriott and these great clients again soon! 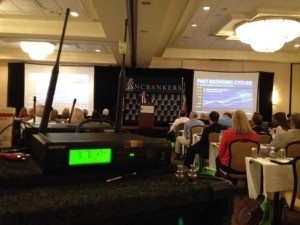 If you are planning a conference in North Carolina or anywhere in the United States or Caribbean, get in touch with AV Connections, Inc. for a quote! Audio Visual Rentals for High Point Furniture Market from AV Connections, Inc.
We will be handling audio visual rentals for High Point Market. We will also provide rental equipment and staging for High Point Furniture Market sales exhibit booths coming up in October, 2013. We are pleased to be both a preferred audio visual rentals supplier to the sales exhibitors in all of the High Point Market building locations. We have two decades of experience with this Market and all of the High Point furniture sales exhibit locations. 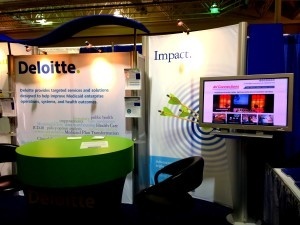 We are looking forward to helping our clients augment their booths with visual aids to enhance their sales efforts at Market. No job at High Point market is too large or too small for AV Connections, Inc.of NC: Some booths will require 10'x10 foot projections screens, others high resolution montiors, or audio equipment. We will be there to help both new and returning clients present the finest booths and product lines at the show. Now is the time to book your audio visual rentals for High Point Furniture Market, call us at 336-768-5454 or email us for suggestions, help, or a quote at avrentals@avconnectionsusa.com. We look forward to serving you with the most reliable and finest quality audio visual rentals at High Point Market and we welcome all of the exhibitors to our fine part of North Carolina! 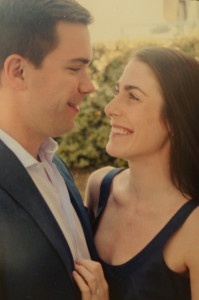 Wedding Video Montage Praise for AV Connections, Inc.
We were so pleased to receive this note of praise for our own Video Production Manager, Trent Perry. Trent completed wedding video montages for both of this happy client's childrens wedding celebrations. 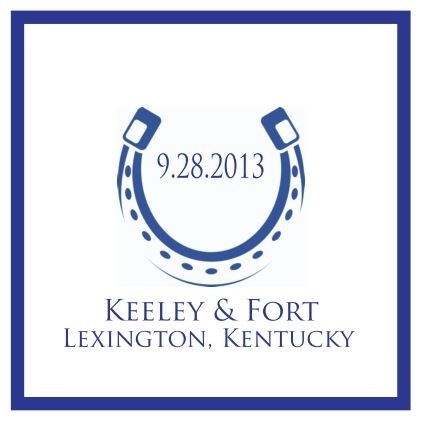 We wish Fort and Keely all the best with their new life together and know this journey will be a wonderful adventure. We are so pleased to have been selected twice by this fine family to create video montages of their children's histories to share with their guests. This work is one of the great joys of our business. AV Connections is always available to help you create the perfect video montage for weddings, rehearsal dinners, anniversaries, special events, conferences, graduations, and meetings. We can help to guide your selection of photos and music and reproduce your final video montage to share with guests and attendees. We will create commemorative video covers and make sharing these memories a highlight of your event and a great take-home memory. If you are thinking of creating a video montage, hiring a professional is the key to a polished finished product. Here is a great quick tutorial on where to begin your planning. Then give us a call at 336-768-5454 or email us at avrentals@avconnectionsusa.com and we will help to guide your perfect montage for your wedding. We can create a video montage for clients anywhere in the United States, let's work together! 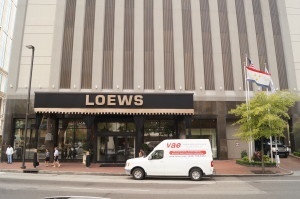 National Audio Visual Rentals from AV Connections, Inc.
We've been in exciting and energetic downtown New Orleans this past week providing audio and visual video rentals for conference and meeting partners at the Loew's Hotel and Conference Center. 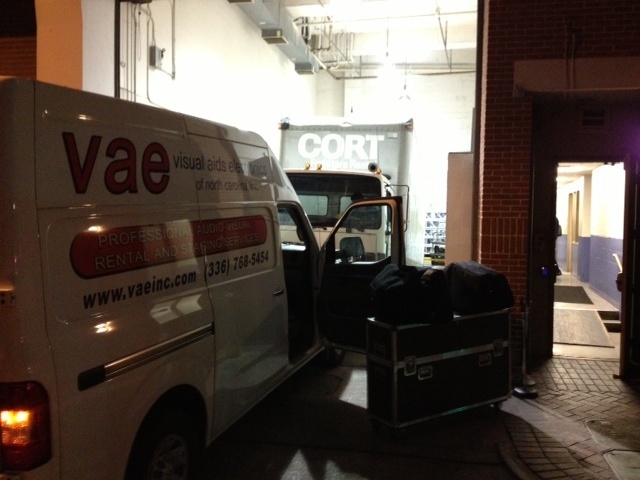 In partnership with our branch office, AV Connections, based in Charleston, South Carolina, we traveled with our audio visual equipment rentals into New Orleans for a two day set up and stay to support a client-firm's staging work at a major sales conference. AV Connections, Inc. is pleased to provide audio visual rentals, equipment, and staging support to large venue conferences throughout the Mid-Atlantic and southeastern United States. 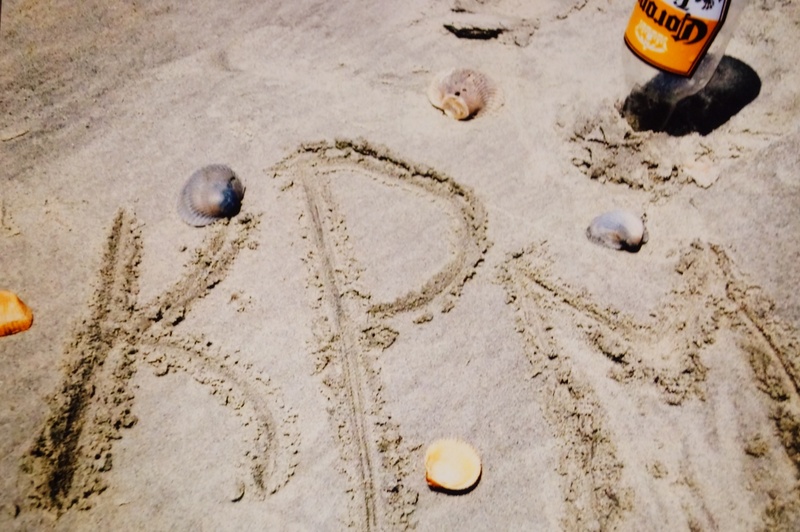 In the last two months our national conference and meeting work includes sites in Virginia, North Carolina, and Florida. Our international work includes major conference venues throughout the Caribbean. This past week we were pleased to be on the road to New Orleans to assist another national audio visual firm with an event at at the Loew's Hotel and Conference Center in New Orleans, Louisiana. 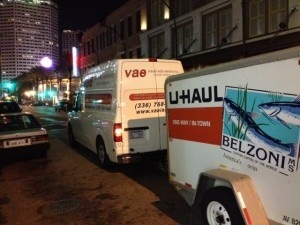 In our business, no distance is too great and no job is too small. We encourage conference and meeting planners of events of every size in any location with need for national audio visual rentals to call us at 336-768-5454 or email us at avrentals@avconnectionsusa.com for a quote. Let's talk, we have options and solutions. 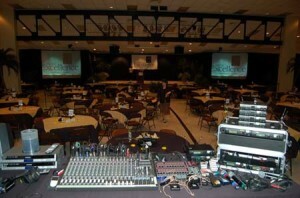 AV Connections, Inc. is the leader in audio visual rentals for conferences, meetings, special events, and weddings in North Carolina and Virginia. At AV Connections, great sound is a must and we will not stop until every pop, squeak, or scratch is effectively eliminated. For our technicians, sound is an art and they strive to ensure it is a pleasurable audible experience for everyone involved. To be a successful audio company, you need the proper high quality gear and technicians who are passionate about what they do. Fortunately we have been providing both for 30 years and will continue to do so for every show, conference, meeting, wedding, or concert that comes our way. So much of how your message is portrayed and presented to your audience is done through visual media. From the moment your guests walk through the door, we will endeavor to stimulate their visual senses, helping to create a memorable experience. With the latest, cutting edge video technology and a knowledgeable staff, AV Connections, Inc.can help you create the visual impact you desire to make your event outstanding. 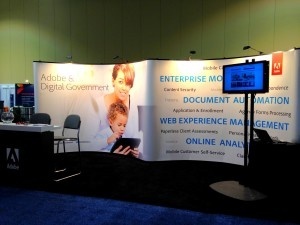 From multi-screen, HD format projection, to live video production switching and recording, we’ve got you covered. With AV Connections, Inc.on your side, you can rest assured that your message with be seen. Whether stepping onto a stage to make that crucial presentation, or walking up to the podium to give a moving speech, you don’t want to be left in the dark. So much of what brings an entire event together is accomplished through creative and effective lighting. With the access to an inventory full of a wide variety of lighting fixtures, dimmers, and controls, AV Connections, Inc.will add that final touch to your event that makes it memorable and exciting. 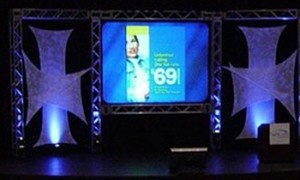 From a simple stage wash, to a full stage production with intelligent moving fixtures, an intricate truss structure, and computerized programming, AV Connections, Inc.can handle all of your lighting needs. AV Connections, Inc. is the preferred supplier of audio, visual, and video equipment and services North Carolina. Since 1985, AV Connections, Inc. (AV Connections, Inc.of NC) has been providing the best the industry has to offer in audio, visual, and video rental and production solutions to businesses from the East Coast to the West Coast, and internationally. AV Connections, Inc. is led by a senior management team that has the depth and expertise that allows for innovative solutions for unique A/V needs. The diversity of our services are virtually unlimited, supporting meetings, conferences, special events including weddings with a product that continuously exceeds our client’s expectations. Through our dedication and focus on every event, our attention to detail, and our experienced and knowledgeable staff, we guarantee an event unmatched in our industry. In 1980, Brad Luckhart began working in the audiovisual world with an audiovisual sales, service, and rental company in Columbus, Ohio. He started off in the rental and shipping and receiving warehouse. In 1983, he accepted the position of Assistant AV Rental Manager with AV Connections, Inc.Corporation at the Hyatt Regency and Convention Center in Columbus, Ohio. Recognizing his passion for the field and his hard working attitude, AV Connections, Inc. Corporation promoted Brad and offered him the title of Branch Manager of Audiovisual Services at the Hyatt Hotel in Winston-Salem, NC in 1983. 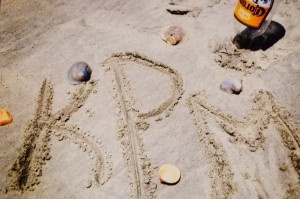 Taking a leap of faith, Brad and his wife, Marjorie, packed up their station wagon and two young children and moved to the beautiful Piedmont area of North Carolina. Seeing the need for a comprehensive audiovisual rental and event production company that not only carries the most up to date, high quality equipment, but also places a priority on superior customer service, Brad and Marjorie bought the branch office from AV Connections, Inc.in October of 1985, and AV Connections, Inc. was born. Beginning with a closet sized office in the Hyatt Hotel, Brad and Marjorie built the foundation of AV Connections, Inc. with the core principles of honesty, loyalty, and hard work. 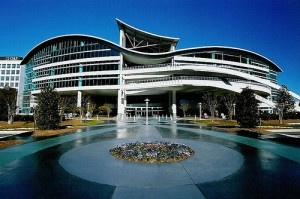 By remaining true to their core principles, AV Connections, Inc. grew into one of the leading audiovisual companies in the Southeast. 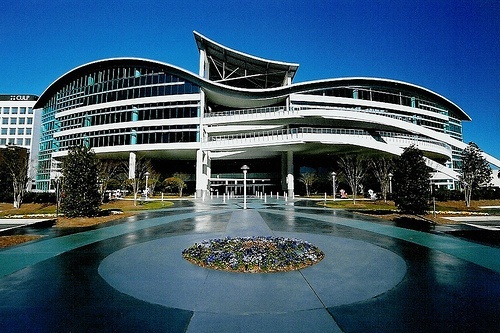 In 2002, AV Connections, Inc. expanded its operations and opened AV Connections in Charleston, South Carolina. AV Connections, Inc.established itself as the preeminent audiovisual rental and event production company in the Lowcountry. Jared has guided AV Connections, Inc. along the path to success using the skills and lessons learned through growing up with the company and following in the footsteps of his parents, and by leading the company into new markets and avenues of expansion. Today, you will find that the same core principles that Brad and Marjorie built the company upon in the 1980’s are still in practice at AV Connections, Inc. . This is apparent in the way we respect our clients, how we treat our employees, and through the friendly and welcoming environment we promote in the office and on job sites.